Which program can burn DVD folder from hard drive to blank DVD disc? Q: Do you have any product to help me burn the DVD folder to DVD disc? A: Yes. Any DVD Cloner and Any DVD Cloner Platinum can help to burn DVD folder to DVD disc, erase DVD, burn DVD to DVD, shrink DVD-9 to DVD-5. Moreover, both programs also can burn ISO Image File from hard drive to blank DVD disc with perfect quality. 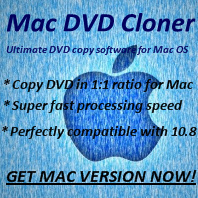 If you wanna convert DVD to videos, then you should have a look at Any DVD Cloner Platinum, which can convert all ecrypted movie DVD to commonly used video formats!